How can those spindly arms wield such giant weapons? If you’re looking at the headline of the article and saying to yourself, “Strength of the Sword 3? I never even heard of the first two,” don’t worry; they don’t exist. Moving past the unusual naming, developer Ivent Games has spent the past five years crafting this title, making it a labor of love. Now the question becomes whether or not people will love the results of this one-game trilogy. From a layout perspective, the setup in Strength of the Sword 3 is efficient. With the face buttons you have two attacks (a slash and a stab), a block and the ability to jump. The right trigger, when used in conjunction with the left analog stick, allows you to dash quickly to elude attacks, while the left trigger utilizes your secondary item. Switching your focus when squaring off against more than one enemy is done via the shoulder buttons. To provide some depth to the combat you’re able to utilize a handful of combos at the expense of your mana meter, which is charged by holding up while blocking. Based on the potency of the combo you’ll sacrifice a set number of bars (the gauge maxes at five). There’s no limit to how often you can recharge, and I found the best approach was to avoid enemies until I was able to attack with combos. Things don’t run as smooth as you’d like them to, however, thanks to one questionable decision to map your secondary inventory to the right stick and make camera adjustments automatic. The camera is too slow to respond to your and/or the enemy’s movement, and even after dozens of fights I still found myself instinctively jamming on the right stick in a vain attempt to bring my foes back into view. More on this later. If you’ve ever seen Lego’s line of Bionicles you’ll probably notice the uncanny resemblance between them and the game’s angular hero. Most enemies tend to sport a lean, wicked look as well, though some of the larger, more bestial ones don’t follow suit. Backgrounds are very simplistic with minimal detail as they simply exist to keep the combatants in an enclosed space. It’s a fairly unique visual approach, but one I didn’t particularly care for. It wasn’t the style that bothered me, however, it was that the combat never felt like it had much of an impact — so much so that there were times where the only way I could tell if an attack had connected or not was to look at the health gauges. The camera always felt a little too tight behind me as well, and I had some issues properly estimating distance as a result. There is a passable soundtrack that’s heavy on drums and offers a nice little upbeat medley when you finish a level. It doesn’t get in the way of the action, either, which is a plus. Sound effects consist mostly of clanks and little else. At first glance, Strength of the Sword 3 looks like it’s going to be another hack n’ slash title where overwhelming odds and cheap tricks will be the computer’s last (and only) line of defense. Banish that idea from your head immediately as nothing could be further from the truth. 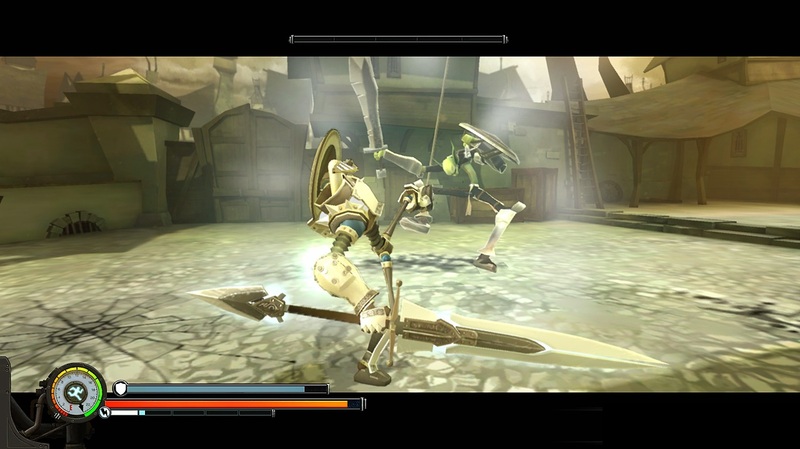 This game is all about outthinking, outfighting and outmaneuvering a series of deadly foes. Every single enemy you face is capable of killing you, and the second you don’t respect that you’ll be staring at a loading screen. There is no story to speak of, and the short, 11-battle “campaign” is really a thinly veiled tutorial designed to introduce you to the mechanics and unlock/upgrade the various secondary skills. Each of the four bosses offers a little something extra in the form of a unique sword and shield — you’ll need to beat them twice a piece to obtain both items — that change things up with the new items slanting toward additional speed or power as opposed to a balanced approach. Where the meat of the game lies is in the challenge pit, which tasks you with surviving as long as you can. Each kill nets you points that can be used to purchase health, additional time or restock secondary weapons (knives, grenades, health packs, etc). Ultimately, though, the game never changes much, and if you don’t appreciate the core gameplay there’s nothing to see here. That core is best described as tactical combat. Fights are cerebral affairs as you dodge, block and counter your opponents, probing for an opening to strike and do real damage. You have to be patient and precise to win. Button mashing will get you killed. Period. It’s unfortunate, then, that something as unique as Strength of the Sword 3 is saddled with a camera that often leaves you vulnerable to unseen attackers. In a game where health is plentiful it’d be little more than an annoyance. Here, where such a premium is placed on every blow, it’s infuriating. Even when it’s working it can be a bit dizzying to see it constantly repositioning itself as you try to evade enemy strikes. Strength of the Sword 3 is an interesting niche game. People that are willing to take a pounding, then stand up, dust themselves off and try again may find it to be a hidden gem. For every person wired that way, however, I’m guessing there are probably 20 that’ll just get frustrated and throw in the towel (or their controller). If you’re among the former give it a whirl and test your mettle; the latter, though, are probably better off looking elsewhere and saving themselves the aggravation.